The winners of these four World Tournament have one thing in common. They all beat Sri Lanka to win the title. Today, Sri Lanka will play their 5th final in a World Tournament in the past 7 years. That is an unbelievable tournament. No other team has featured in so many finals in such a short period of time. No other team has a better record than Sri Lanka does in World T20 matches, where their success percentage is second to none. Yet, they do not have a world title to boast of. Tonight will be their 5th attempt and probably their best chance to make it right. Sri Lanka have been in stationed in Bangladesh since the end of January. Barring the loss to England (read Alex Hales), Sri Lanka have won everything in Bangladesh over the past 10 weeks: the test series 1-0, ODI series 3-0, T20I series 2-0, Asia Cup title without losing a match, World T20 group games and semi final. However, all this will count for little when they take the field against India, a team that has been on a roll in this World T20 tournament. India have dominated this World T20 winning all their games in convincing fashion. It is no doubt going to be a tough contest as Sri Lanka try to overcome their final syndrome and India aim to become the holders of the all three limited overs ICC titles - World Cup, Champions Trophy, and World T20. MS Dhoni is the only captain in the world who has held all three titles, and tonight he will want to become the only captain to hold all three titles at the same time. On the other side, Mahela Jayawardene and Kumar Sangakkara will want to ensure that they hang up their boots as at least one time World title holders. Jayawardene is the leading run scorer in all World T20 matches and the second highest run scorer in World T20 internationals. It is more than likely that he will end his T20I career in those positions as well. There is absolutely no doubt about the impact that players like Dhoni and Jayawardene have on their respective teams. Do you know how to measure this impact? There's a new cool app in town that enables you to measure the impact a player has made in a T20 game. The new app is called 'Zip Factor' and it has been developed by Castrol Activ Scooter. 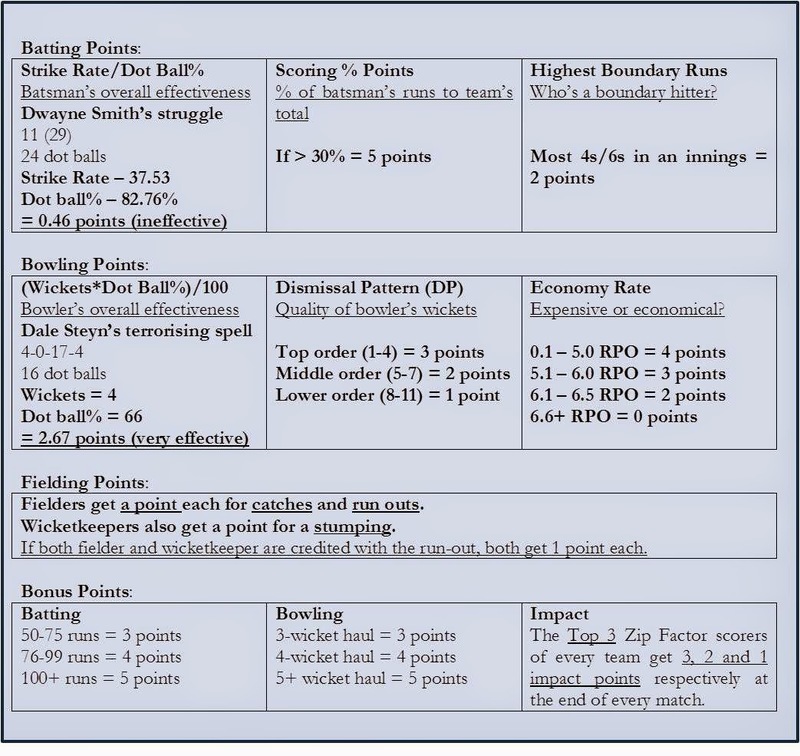 Harsha Bhogle and Rahul Dravid recently spoke about measuring the impact of a player in a T20 game and introduced the Zip Factor, which takes into account batting, bowling, and fielding efforts of players and determines their overall impact. The following table illustrates how the Castrol Active Scooter Zip Factor works. Start using the Zip Factor and determine the impact that players make. It will be a cracker of a final tonight... and it will be interesting to find out which player had the largest impact on the final of the ICC World T20.